“Wisdom teeth,” a rather curious name for teeth if you think about it, is the folklore name for third molar teeth, which usually make their appearance later in life. So-called because a moderate amount of wisdom is supposedly achieved at about the same time these teeth typically make their appearance, between the ages of 17 and 25. Interestingly, current research shows that the brain is not fully mature until age 25, so there may actually be some truth to the myth. Most adults have four wisdom teeth; although, it is possible to have more (supernumerary teeth) or fewer to none at all (hypodontia). However, there is little wisdom to the problems that seem to be associated with them more often than not. Wisdom teeth commonly affect other teeth as they develop by becoming impacted, coming in sideways, or in fact it seems — every which way, but up! Below is a summary of facts you need to know about this very topic and a review of problems associated with them and their retention and/or removal. While it is not possible to predict the way your wisdom teeth will erupt (become visible) or come into proper position and useful biting function, in all cases adequate space seems to be necessary to allow for successful eruption. Simply put, there has to be enough room for them in the mouth. Assessment of this space can be determined using a variety of radiographic (x-ray) and other imaging techniques. However, the fact they can erupt does not guarantee they will, and if they do surface, that they will arrive healthy, particularly with respect to the surrounding gum tissue. Figure 1: Image showing the upper wisdom tooth having a slight disto-angular position and a lower wisdom tooth horizontally impacted close to the nerve. Figure 2: Image showing the lower wisdom tooth having a mesio-angular position and an upper wisdom tooth up against the second molar roots. 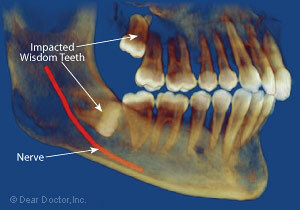 Figure 3: Image showing the lower wisdom tooth having a horizontal impaction that can damage the second molar roots and cause possible periodontal disease. 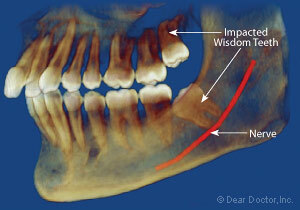 Figure 4: Image showing a different view of the same wisdom tooth causing the potential for pain (pericoronitis). 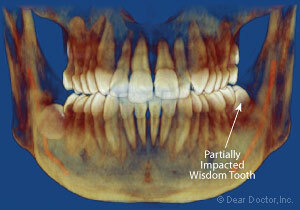 Figure 5: Image showing the lower wisdom teeth that is partially impacted causing the potential for pain (pericoronitis). 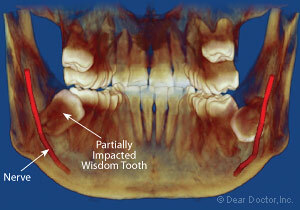 What Is The Impact Of Impacted Wisdom Teeth? The term “impact” generally refers to the influence or effect of an object on another. In regards to wisdom teeth, this term typically means that the tooth or teeth are impinging upon or plain jammed against other important structures. These can include adjacent teeth, gum or other soft tissues in the mouth, nerves and blood vessels, or other structures. The direction in which a problematic wisdom tooth is pointing is often used to characterize the impaction, for example horizontal, disto-angular (“disto” – backward; “angular” – forming an angle; together they describe a tooth growing in a backwards direction) [Figure 1], or mesio-angular (“mesio” – forward; a tooth angled forward) [Figure 2]. Why isn't there enough room? Most often there is a discrepancy between jaw and tooth size with too little space available to accommodate the third molar (wisdom) teeth. The most common consequences of impacted wisdom teeth are periodontal (gum; “perio” – around; “odont” – tooth) problems and are the most frequent consideration for their removal. Their presence can adversely affect the periodontal tissues of the adjacent second molars by disrupting the periodontal tissue attachment — the mechanism that anchors the teeth in their surrounding bone — leading to their loss by predisposing them to bacterial, plaque-induced, periodontal disease. 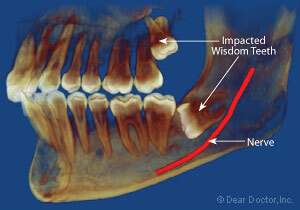 They can also cause root resorption (eating away) and damage to adjacent tooth roots [Figure 3]. The presence of visible (erupting) third molars is often associated with overall elevated levels of periodontal disease and that of adjacent teeth. Periodontitis involving adjacent teeth may be progressive and only partially responsive to therapy because they are difficult to reach and treat, including limitations to mechanical removal of bacterial (dental) plaque biofilm. The presence of pocket depths greater than 4-5 mm and/or bleeding when probed during examination should alert your dentist of potential future progression of periodontal disease. Painless: One interesting fact is that in most cases, impacted teeth can exist quite asymptomatically; in other words, you wouldn't even know they are there, let alone causing problems. However, impacted, submerged, third molar teeth can become cystic (surrounded by a closed sac or membrane) and cause loss of the surrounding jawbone and possible infection. They can also interrupt vital structures: in the lower jaw, like the neurovascular bundle (“neuro” – nerve; “vascular” – blood vessels; “bundle” – just like wires running in a cable) that supplies sensation or in the upper jaw, impacting or entering into the sinus. In either case, these teeth are located where they're not supposed to be yet are causing no pain. Painful: On other occasions, they will really let you know they are there with a painful pericoronitis (“peri” – around; “corona” – crown; “itis” – inflammation) [Figures 4 and 5]. This is an acute inflammation and infection of the surrounding gum tissues that typically occurs with a partially erupted, lower wisdom tooth. It is usually treated with gentle irrigation (washing out) to remove bacteria and other trapped debris, warm soothing saline rinses, non-steroidal anti-inflammatory drugs like aspirin or ibuprofen, and sometimes antibiotics. Since this condition is likely to be recurrent, it is important to have the affected tooth or teeth evaluated for removal. It is especially important to have routine dental exams between the ages of 17 – 25, when third molars are typically coming in, because impacted wisdom teeth may cause no pain. Risk Factor: It is especially important to have routine dental exams between the ages of 17 – 25, when third molars are typically coming in, because impacted wisdom teeth may cause no pain. An additional periodontal risk factor for third molars is whether or not their presence — asymptomatic or otherwise — influences the risk for adjacent teeth to develop periodontitis. 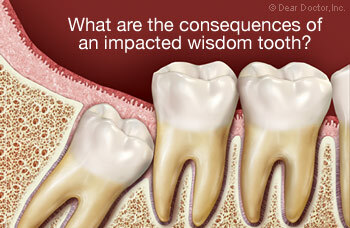 Consensus: An impacted wisdom tooth is called asymptomatic if the person does not experience signs or symptoms of pain or discomfort associated with this tooth. General agreement exists that removal is appropriate in cases of symptoms of pain or pathological (disease causing) conditions.